There’s something supremely satisfying about using all the parts of an animal or vegetable, about not throwing out those parts, but recycling them -- not in a blue bin, but in ways that form even more food that you can eat (even if -- and somehow, especially because -- that transformation takes time, whether it's seven hours or two months). That said, I do enjoy eating most parts of vegetables, fruits, and animals. Most vegetables you can eat most of. Fruit we treat similarly: we almost always eat the peels, the notable exception being citrus, and for that, I’ll zest the peels and use them in baking, soups, and other recipes (on the rare occasion that I feel like painstakingly scalding, scraping, and candying them, I’ll use them that way too). And animals! Suffice it to say, my favorite thing to eat when I was two was pigs’ ears (still a well-loved food of mine); I love scooping out bone marrow and eating it on a bit of toast; and as my husband says, I can gnaw a chicken or rib bone so clean it turns chalk white. But, sometimes you can’t eat everything. You can’t eat the actual chicken -- or more recently, the turkey -- bones. Eating carrot peels or celery ends isn’t particularly pleasant, nor is eating somewhat wilted herbs. Yet you can give these odds and ends new lives, repurposing and stewing them so that they create rich, new products that you wouldn’t otherwise have. 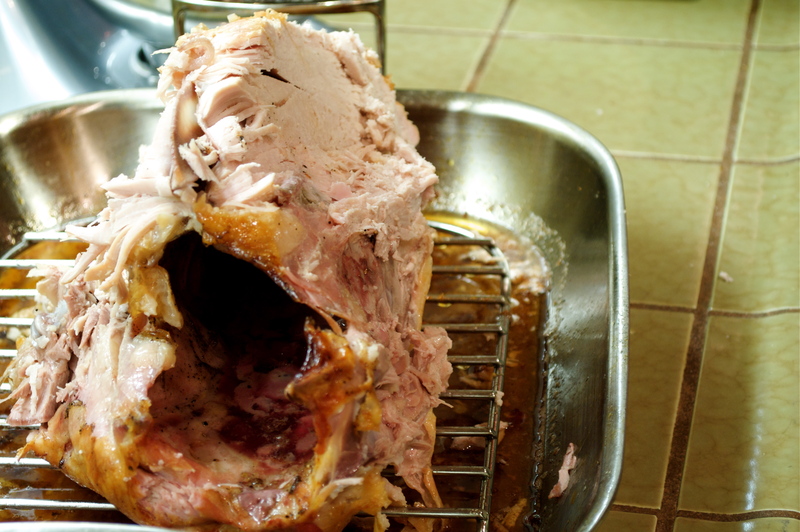 After the first Thanksgiving we hosted (click here for that story), I had a turkey carcass, extra vegetables, and a bag of parsley that was teetering on the edge of near-mush taking up space in my fridge. So I did what I love to do when I have that melange of ingredients on hand: I got out the 12-quart stock pot, fired up the stove, and made turkey stock. 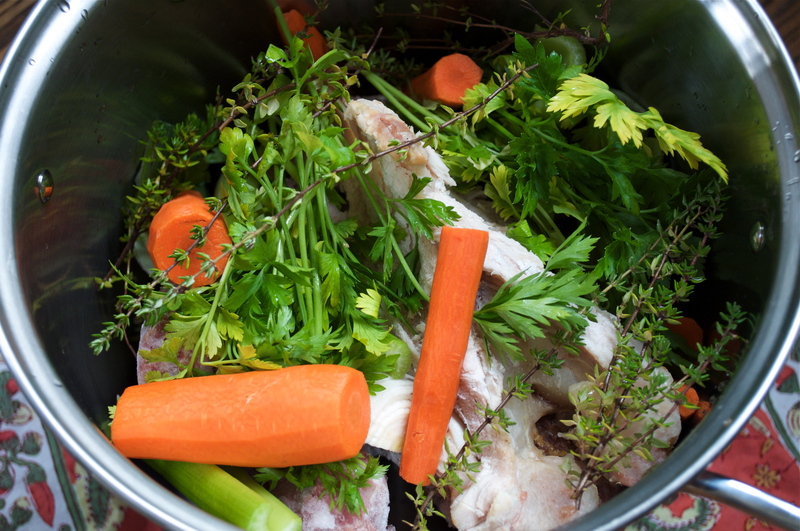 A -- Aside from the bird bones and water, I always also put in the onions, carrots, leek, garlic, bay, and peppercorns, but sometimes I leave out the celery if I don’t have it, and I put whatever mix of almost-fresh herbs I have in the pot. B -- I usually put the gizzard, heart, and liver in the pot too -- it clouds and darkens the stock but my husband and I like the richer flavor. C -- I typically simmer it for a slightly shorter time than stated in the recipe -- anywhere between 5-7 hours -- and it turns out great. D -- I usually don’t have 4 pounds of bones at once, so as I roast chickens, whole or in parts, I put the bones in a freezer bag until I have 4 pounds’ worth. Seven hours later, the stock was ready to be strained, chilled overnight in the fridge, and ladled into one- and half-cup storage containers for easy future use. There’s nothing like seeing that liquid gold, piled up in rows in the freezer and ready to use anytime, to make matzoh ball or tomato soup, or to enrich a dish of chicken with lemony greens. When I need to use the stock, I put the frozen containers into a big bowl of hot water to defrost them slightly, then slip out the poultry popsicles into whatever I’m cooking. 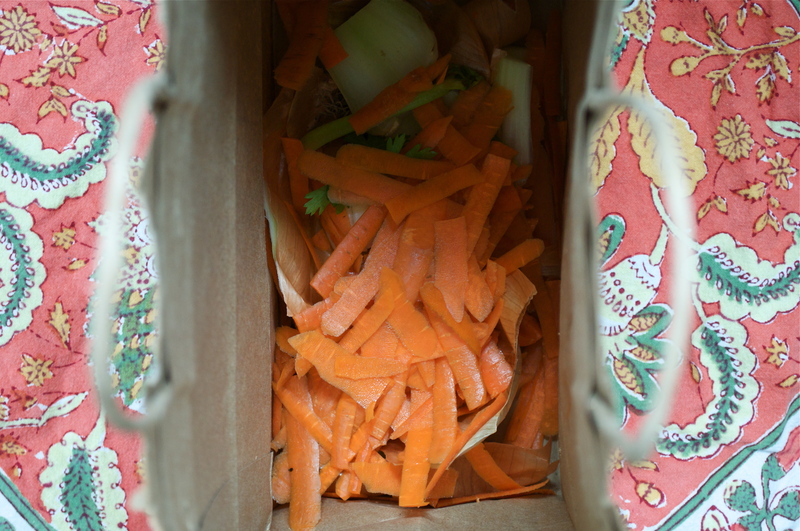 The carrot peels, tough green parts of the leeks, celery ends, and onion roots went into a brown paper bag. When it gets a bit fuller, I’m going to dig these kitchen scraps into our newly-installed veggie bed and let them rot into the dirt over the next couple of months. What would otherwise be garbage will instead convert my dirt into (hopefully) rich soil, from which new veggie life will emerge next spring. It’s pretty amazing to create something out of nearly nothing. How do YOU use all parts of animals and vegetables in your kitchen and garden?